Have I mentioned River's unbridled aversion to reading and writing? Oh, about a thousand times? Yeah, I know. I had another opportunity to review a beginning reading/writing program for him. My expectations were low, River simply doesn't want to read and write at this time. 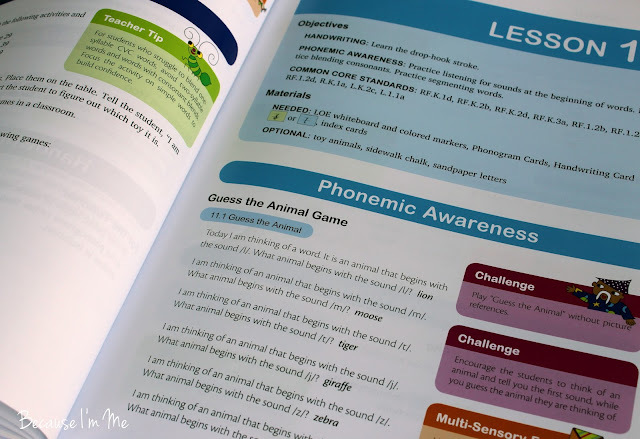 Logic of English's Foundations curriculum is a beginning reading, spelling, and writing program for 4-7 year olds. River and I were asked to review Foundations Level A, the first of a series of 4 Foundations books. I received the hardcover Foundations A book, the softcover Foundations A workbook, a fantastic whiteboard, pictured below, two sets of flashcards - one for phonograms and one for manuscript writing, a pretty laminated multi-page manuscript chart, and two sets of game cards. 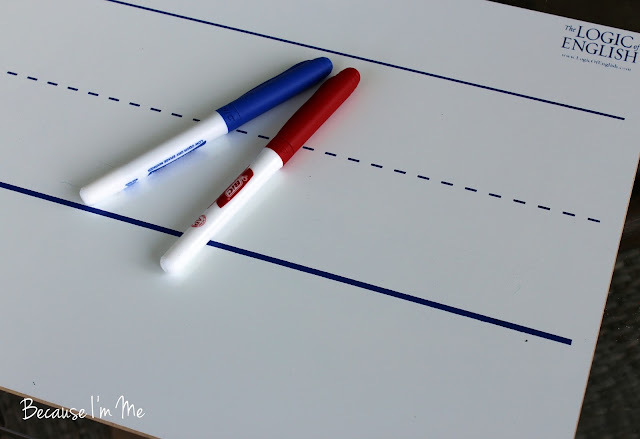 Before getting started I moved the flashcards to ziploc bags and purchased some dry erase markers for the whiteboard. Here's where it gets cool ... 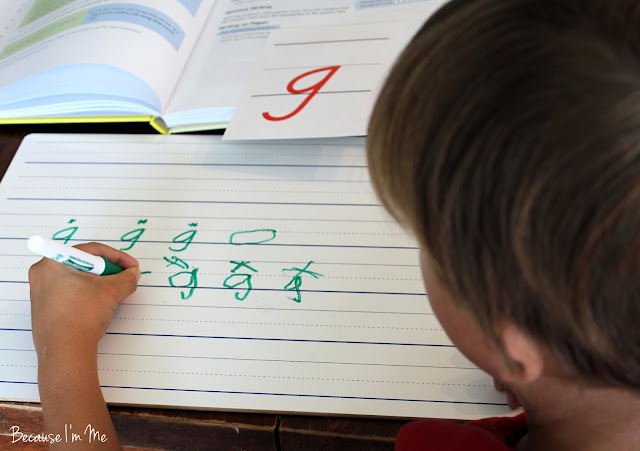 The first lessons teach the child about the three lines on handwriting paper - the topline, midline, and baseline, which are much easier to learn and understand than "you start here". Next taught are basic strokes - a roll stroke, a swing stroke - instead of whole letters. River enjoyed making swing strokes (while saying "swing") and down strokes (while saying "down"). 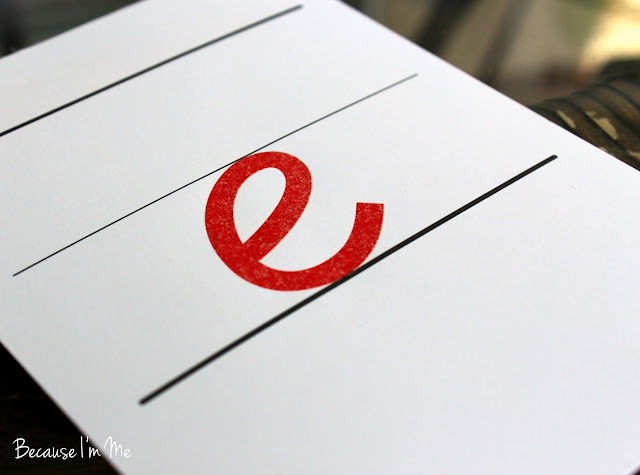 After a few lessons he was introduced to the letter "a", which is simply a combination of strokes he'd already learned. Strokes, and eventually letters, are written with a finger in the air, on the dry erase board, in the student workbook, with chalk, and so on ... fun stuff, not boring repetition, in fact when he does write in the workbook it was just a few strokes/letters on each line, not rows upon rows of them. For the first time he has no complaints about doing handwriting. He also learned how to draw stars for his "best" letters and strokes. Helping to teach the strokes/letters are the tactile manuscript cards. Yup, tactile. The letters are red and textured like ultra fine sandpaper. River traced the stroke or letter with his finger, feeling it, making an easier transition to then writing it on paper. 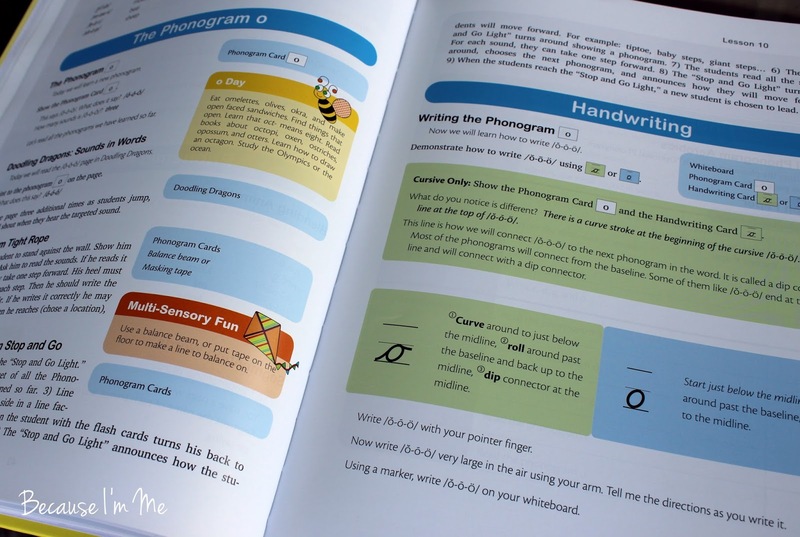 At the same time River is learning basic strokes he is learning basic isolated sounds and how they are made (do you know what nasal and voiced sounds are? River does). River has had problems with some of his sounds, most specifically the "S" sound and, sometimes, "R". He's been evaluated for speech therapy and was given a "wait and see" diagnosis, hoping he'd outgrow it. Focusing on the specific sounds in the lessons is really helpful for his speech.The focus isn't on HIS speech, just on saying the sounds right, so there is less pressure to "fix" what he is doing wrong, allowing the focus to just be on making the sound. The lessons incorporate lots of movement and games and even opportunities to teach Mommy and "buzz" here if she gets a wrong answer (his favorite part of the lessons). The variety is the lessons is appreciated by both of us and we're having a lot of fun with them. The other kids have been eavesdropping and are amazed at what River is learning. "I never knew that" and "I wish I'd learned it that way" are heard often, as is "I wish I could jump around and run in the kitchen when I do schoolwork". River and I do the lessons together, and each lesson takes about 15 minutes. Each lesson clearly states at the beginning what supplies and cards are needed. As much as River has resisted handwriting and reading I'm impressed by how much he likes doing these lessons. I'm also even more impressed by what he's retaining. The thing is, he's not just memorizing stuff, he's really learning the letters and sounds and becoming comfortable and familiar with them and his confidence is growing. When I initially looked at the books and flashcards I expected my review to read something along the lines of, "Nice program. I look forward to trying it again when River is a little older and more interested", but was wrong on that one, he was interested and engaged from the first lesson. He sees it as fun and games, not learning, which is just how it should be for a four year old (and if the only thing he gained was realizing that the things we do with letters could be fun I'd be perfectly happy; everything else is icing on the cake). I only found two minor negatives: 1.There is an assumption that the teacher/parents knows the sounds of all the phonograms. Sometimes I don't and have to look through the lessons to figure them out. I wish there was a "cheat sheet" for the phonograms. This is a very minor issue and I was able to work through it. 2. 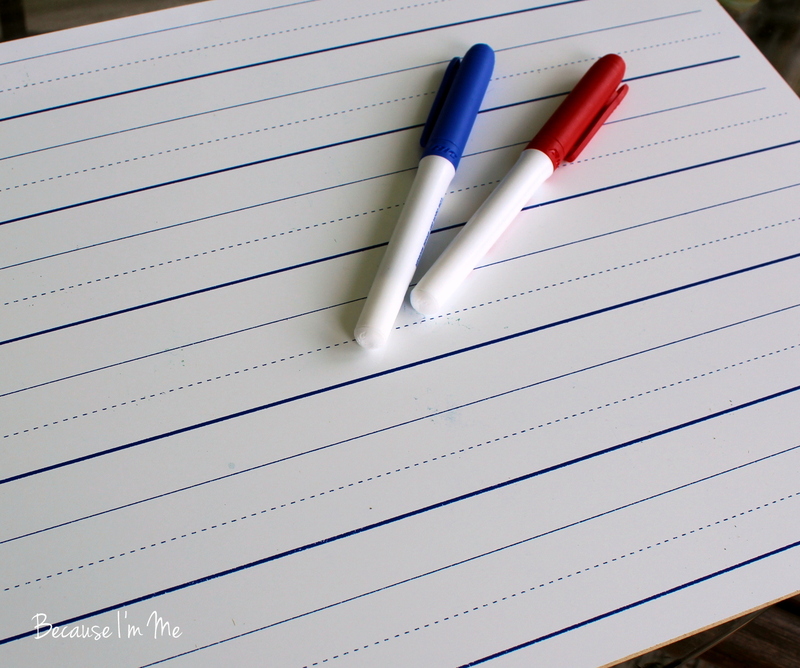 The dry erase board is tough for lefties. River didn't like putting his hand on the page because he'd get the marker ink on it. We solved that by using the side of the dry erase board with smaller lines. I truly have to give this program an A+. River and I are both looking forward to continuing to have fun with the Foundations program. 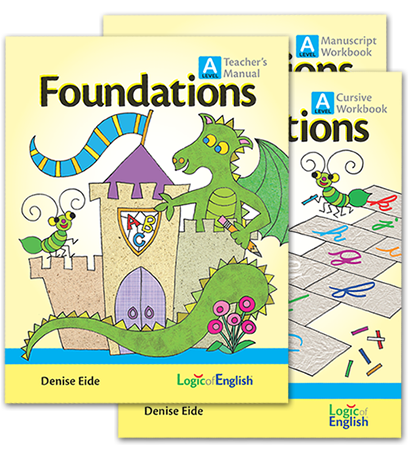 Foundations Level A (and B, C, and D) can be purchased at Logic of English. The teachers manual and workbook, available for manuscript or cursive, cost $56.00. Adding the flashcards, game cards, dry erase board, and other items I received brings the total to $134.00, however the flashcards, etc. only need to be purchased once and can be reused for the next levels.